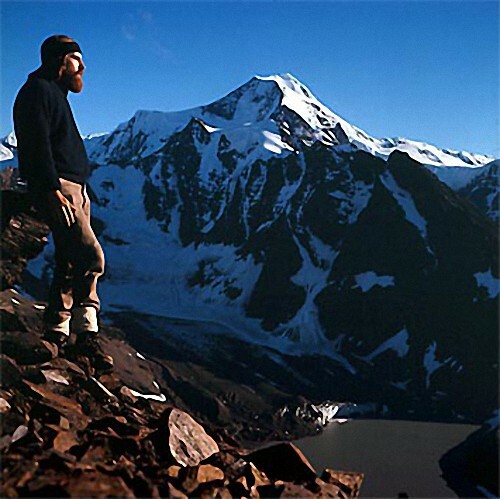 Images from John Kilroy’s time in South Georgia with BAS - 1971 to 1973. 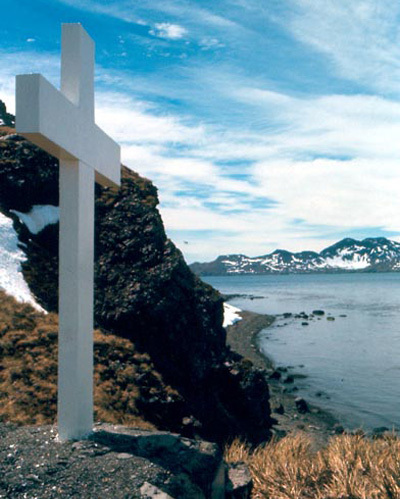 On the left, John with Sugartop Mountain in the background, and on the right Shackleton’s Cross at K.E.P. 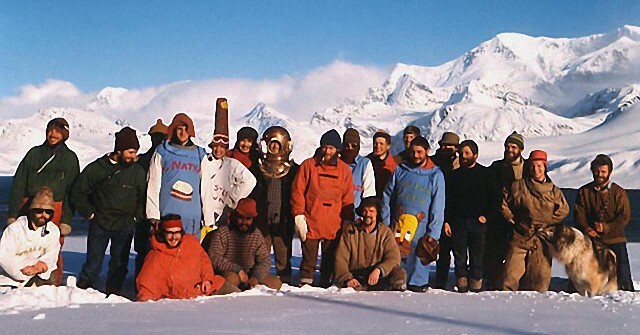 There is a rather light-hearted feel to this group photo taken 45 years ago. 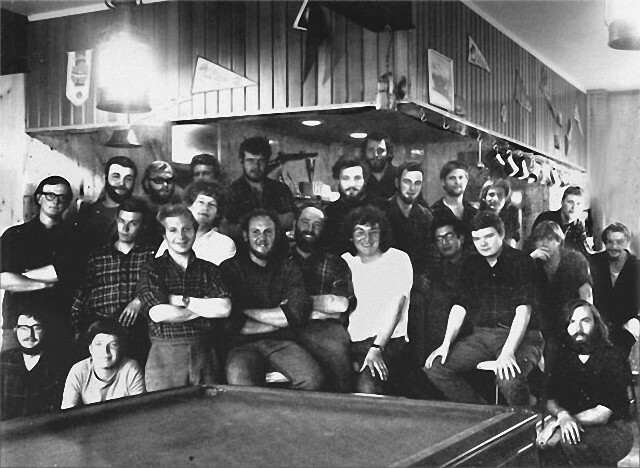 The South Georgia Lounge in the early 1970s. On the left a great shot of the floating dock actually floating. All that can be seen now are the tops of the handrails. My uncle Bill Howieson worked on this dock in the mid 1950s when it was based at Leith Harbour. 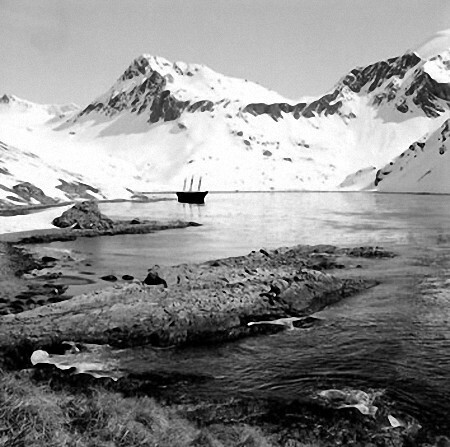 This is one of the first photographs I have seen with it actually afloat after whaling ceased. 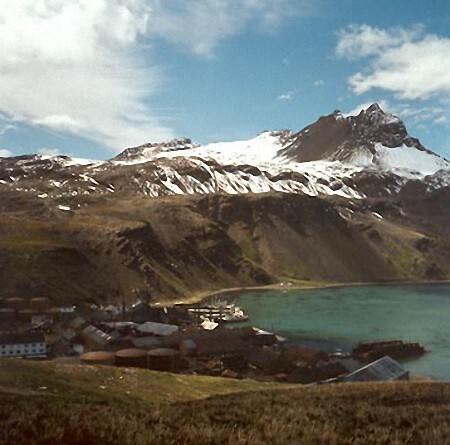 Right, a lovely view looking down the mountain over King Edward Cove and Grytviken. The floating dock can be seen to the bottom right of the picture. 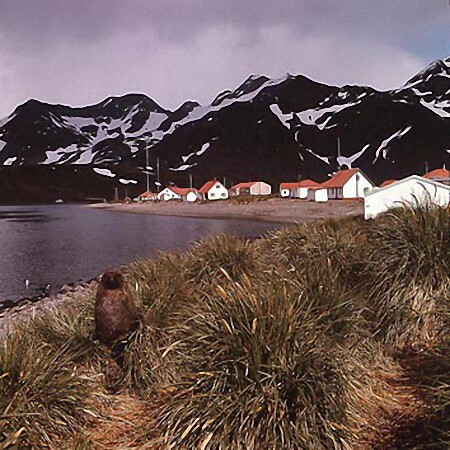 Left, a fur seal (Arctocephalus australis australis) looks out of the tussock grass at King Edward Point. 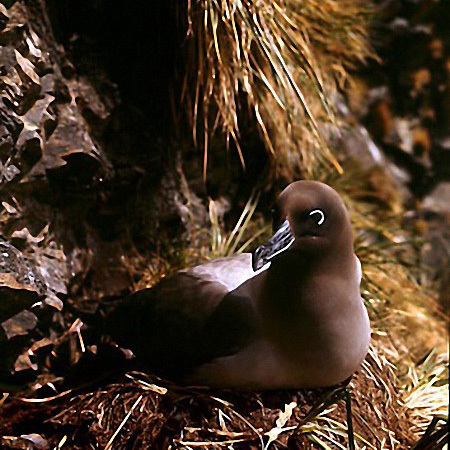 Right, a light-mantled Sooty Albatross (Phoebetria palpebrata) seen here at King Edward Point. 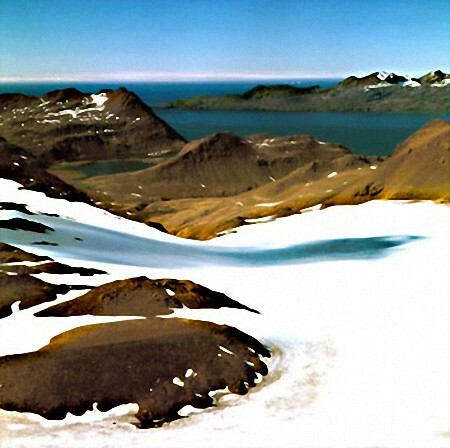 Left, a gorgeous view from the mountains, looking down to King Edward Point (to the left of middle centre of the picture) and Cumberland Bay West. 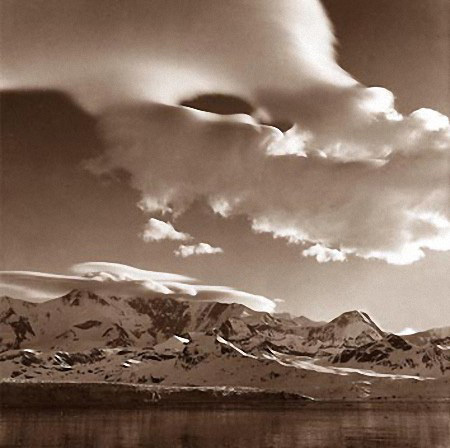 Right, beautiful cloud formations in this sepia tone photograph of Mount Paget. 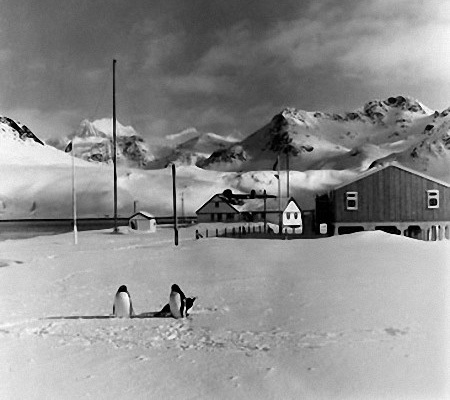 Left, the accommodation building "Shackleton House" at King Edward Point. 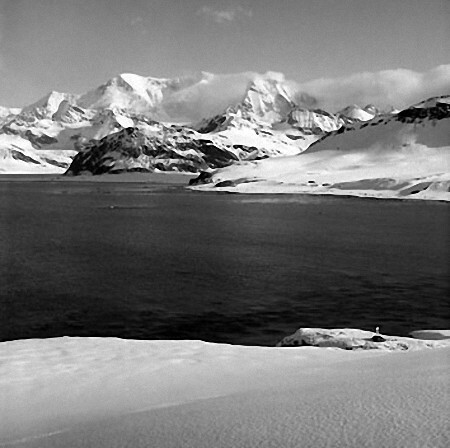 Right, looking down the mountainside with Shackleton's Cross in the right foreground and Mount Paget in the distance. 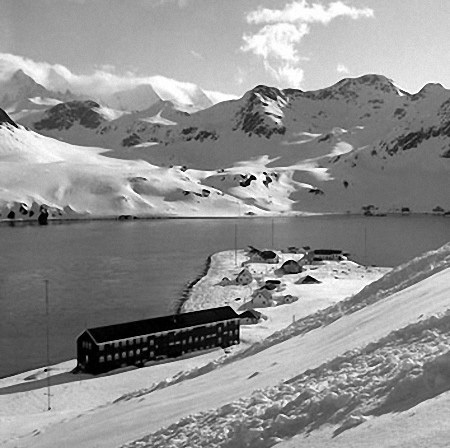 A nice picture of "RRS John Biscoe" in the foreground at King Edward Point and "RRS Bransfield" on the Harpoon Jetty at Grytviken in the distance. Left, a superb view over the bay, taken from "HMS Endurance's" helicopter. 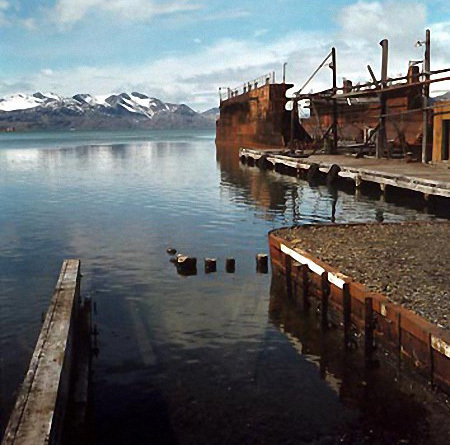 "Endurance" is seen on the left centre of the picture, alongside at Grytviken. 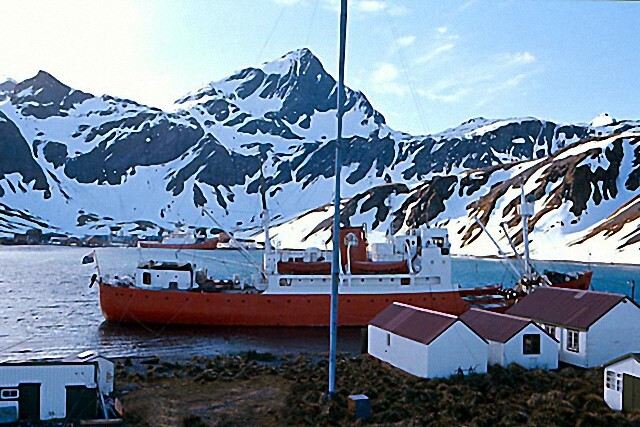 "RRS John Biscoe" is seen over on the right upper centre moored at King Edward Point. The hulk of "Louise" is in the centre of the picture with the floating dock just to the left. 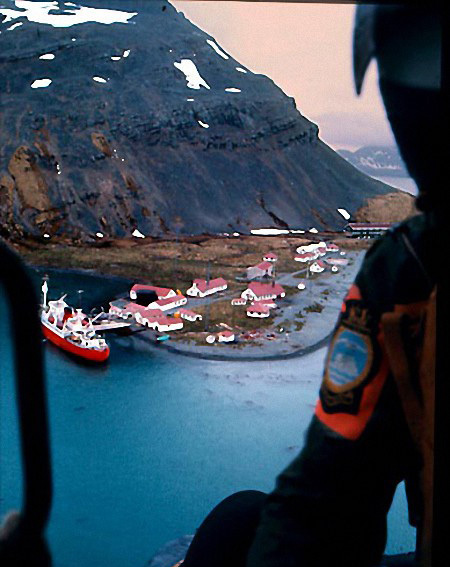 Right, "RRS John Biscoe" moored at King Edward Point, seen here through the door of the helicopter from "HMS Endurance". 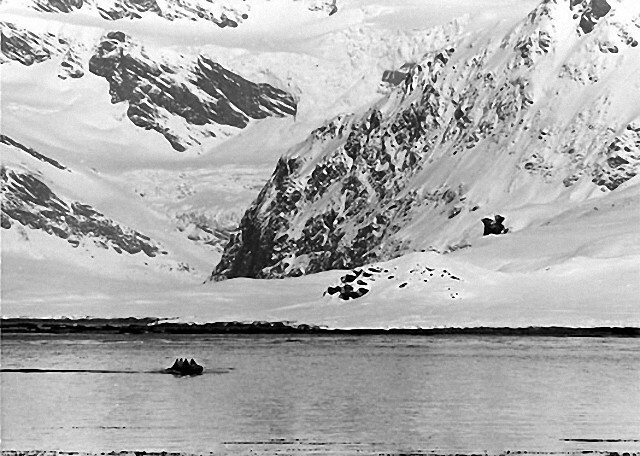 The men in the "C" Craft look very small with the imposing mountains looming up over King Edward Cove. 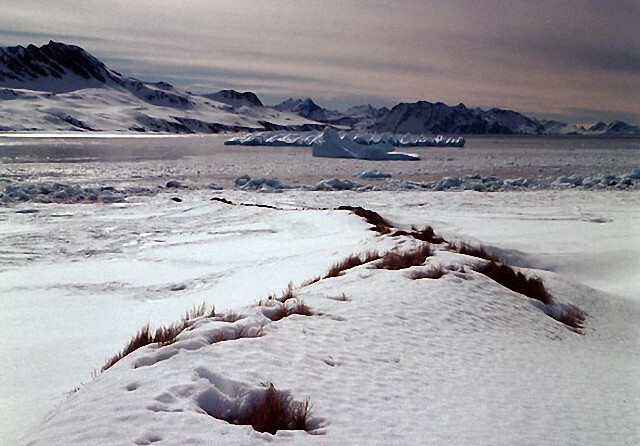 Left, Gentoo penguins on the foreshore at King Edward Point. 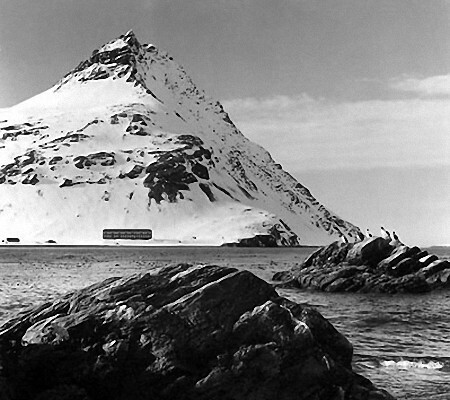 Right, a view of Shackleton House from across the bay. 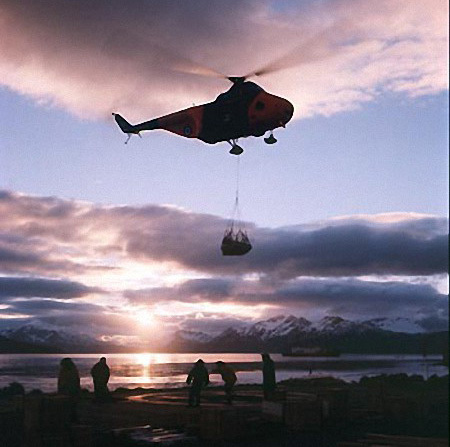 Left, a gorgeous evening shot of the helicopter from "Endurance" with some supplies. 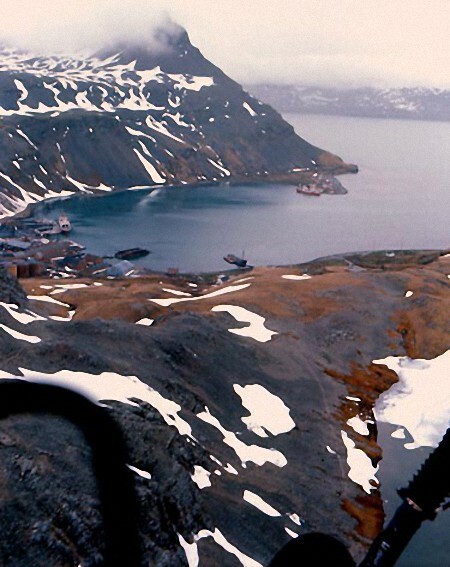 Right, a tranquil view of Ocean Harbour with the hulk of "Bayard" in the background. A typically cold and barren view of an inhospitable landscape - the barff. 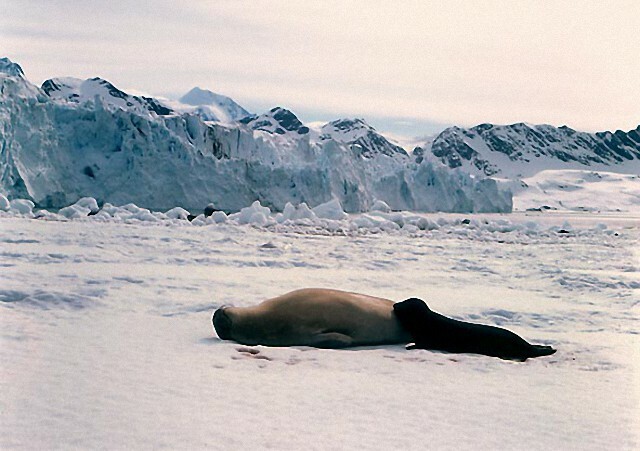 A female seal suckles her pup on the barff - Nordenskjöld Glacier. 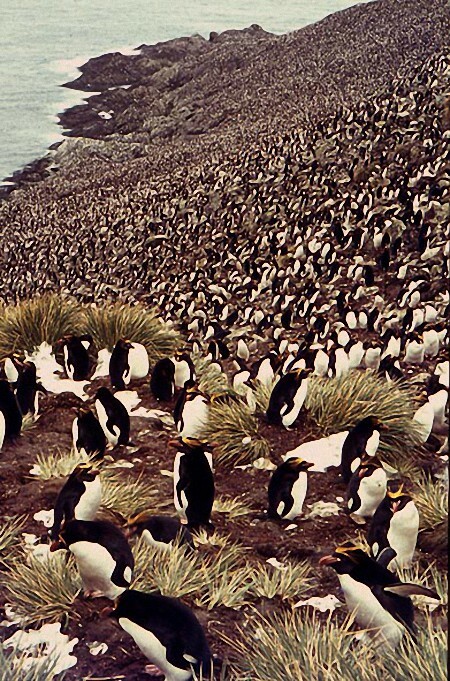 A super shot of Macaroni Penguins (Eudyptes chrysolophus) on Bird Island. All images by, and copyright of, John Kilroy.